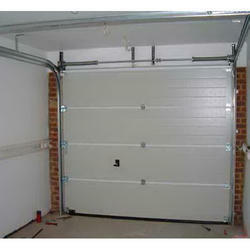 Manufacturer & Trader of Sectional Doors & Garage Doors. Our product range also comprises of Fabrication & Maintenance Works, Rolling Shutters and Steel Railings. Sectional Doors from the best companies in Italy installed at loading/unloading points. Available in horizontal and vertical sliding type with tracks and coupled profiles. It is made up with 1 mm thick aluminum sheet filled with polyurethane rigid foam puff double skinned thermally insulated to make over . It is also compatible with remote, loop detectors, door interlocking systems, and access control systems.